This is a hook story. To the best of my recollection, roughly around 2006 or 2007, the Mustad Hook Company introduced their new line of so called Signature™ hooks to replace their older Classic™ hook line. My introduction to the new signature hooks occurred when I was staying in Ron Zeelor’s Victorian Altmar NY house when he owned it; while using Ron’s fly tying bench a fellow fly tier offered me some of these hooks to try; the new signature hooks appeared sturdier than the Classic hooks, so afterwards I tied all my new flies from that time forward replacing roughly 20 percent of the flies in my collection with flies tied on the new hooks each year. "Set the Hook! The reason you're losing fish is you don't set the hook properly. You're getting older and losing it!" If you can find any, please let me know." As a test, on November 3, 2011 at the Salmon River's School House pool Ed Martin and I agreed to fish with only Mustad Classic or equivalent hooks and netted and released roughly 100% of all the fish we hooked - approximately 10 steelhead - the only escapees were the ones that managed to break-off. Hooray! The good-old-days were back again! Why? Lighter leaders stretch more than their heavier counterparts, so one explanation could be that the Classic hooks "stick" better with lighter leaders. We use 3 to 6 pound Drennan™ leaders for Salmon river steelhead. The result seems to be more hook-ups in situations where the strike is towards you resulting in slack line, and a better retention rate for actual hook-ups. 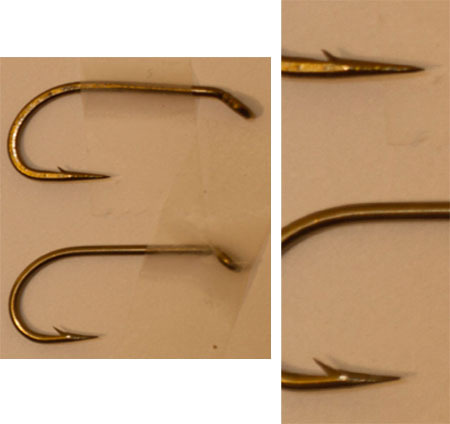 Here are three comparison photos of Mustad 3906 Classic and Signature hooks; the first photo shows Mustad Classic and Signature hooks side by side; the second photo is an enlargement of the first photo showing each hook's point and barb; the third photo shows only the enlarged hooks side-by-side. 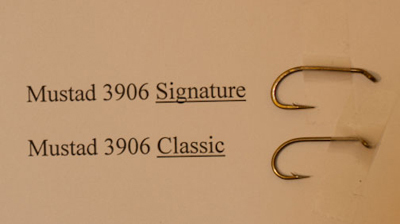 In my book Buck Bug Magic: Catch More Atlantic Salmon which is available for sale on Amazon.com, I mention that my Atlanticok-up retention rate exceeds 80 percent, but this percent is based on use of Mustad Classic 3399A and 9671 hooks. Well, based on my Steelhead experience with "micro barb" hooks, I suspect this 80 percent number would be dramatically reduced. This proposition will not be tested by me since I have a supply of Classic Atlantic salmon hooks sufficient to last my lifetime. How long will it be before the hook manufacturers produce fly tying hooks that are as effective as their older models? I would appreciate reader hook feedback; and if I discover any answers, I will post them on this web site. Currently I am testing egg hooks for Steelhead. In the meantime you are on your own and should look very closely at your own hooks through a magnifying glass (hopefully you will have some older hooks to compare with the newer models). Do not assume that your current hooks will perform as well as the older non micro-barb hooks! So, for the time being, look with favor on older single down-eye hooks with non "micro-barbs".